GridViewDynamicHyperlinkColumn derives from GridViewBoundColumnBase class. Except the binding to the desired property of your business object it allows you to easily specify an URL for the hyperlink that hosts the content. DataMemberBinding - you can specify the property of the business object to be displayed as value in the cell. It is automatically displayed as a link. NavigateUrlMemberPaths - you can specify comma separated field names. NavigateUrlFormatString - allows you to provide a format string for the value of the URL. That way you can easily format URLs provided as relative by the business object. To learn more about formatting you can check Data Formatting topic. TargetName - specifies the location to open the link. 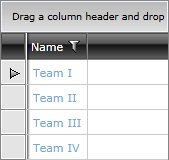 Example 1: Define GridViewDynamicHyperlinkColumn in XAML. Example 2: Define navigate url without additional format.